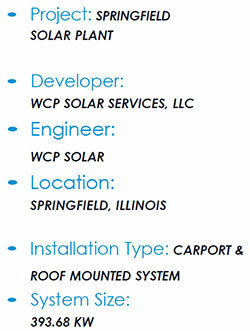 WCP Solar was contracted to design and construct a carport & rooftop mounted solar system on a car parking lot and building hosting an Engineering Firm, located in Springfield, Illinois. This grid connected system ties directly into the City Water Light and Power (CWLP)utility’s power grid and generates enough electricity to provide power to more than 89% of the facility electrical needs. The project is sized at 393.68-kWp1, using 3,762 CdTe, Thin Film, frameless photovoltaic panels rated at 80-W and 216 XT-M tenK panels rated at 440-W for the rooftop Solar system. The carport system is sized at 258.32-kWp using the esthetically pleasing, all black CdTe, Thin Film framelss panels. The system employs 7 string inverters and Micro-inverters appropriately sized to convert the DC energy produced by the solar plant into AC energy. In addition to providing significant energy savings, the solar system will produce approximately 492 Solar Renewable Energy Credits (SREC's) annually and also qualifies for significant federal tax credit, local, and State rebates. It is estimated, that based on the incentives received, favorable inovative financing provided by Developer, and the energy savings being experienced, the system will be cash positive from day one. The Solar System will be the largest carport system in the USA employing the CdTe, Thin Film, all glass, framelss Photovoltaic panels. Estimated completion date May, 2017.